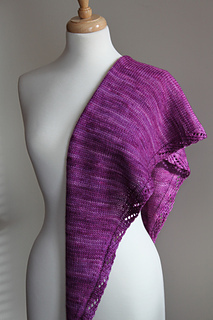 This shawlette is worked sideways - from end to end. It uses 1 entire skein of Malabrigo Arroyo. When substituting yarns, pay attention to the amount of yarn needed for each section of the shawlette. Percentages are included in the pattern. Weigh your chosen yarn before you begin and periodically as you knit to make sure you have enough for each section. This is the second pattern in the Lacy Lady Collection. Other patterns include the Lacy Lady Scarf and Lacy Lady Beret. Each pattern may be purchased separately or all three may be purchased as an ebook set. Finished measurements: Approx 11 inches 25 cm wide at widest point and 69 inches 173 cm long, after blocking. Pattern includes charted and written instructions, diagram, and list of abbreviations. Skills required: Lace knitting (k2tog, yo, RT) and blocking; increasing and decreasing.